The auditory system is the sensory system that allows for hearing. The human auditory system illustrated at right is an extremely intricate and brilliantly designed system that offers a testament to God's infinite knowledge of design. There are three portions of the ear: outer ear, middle ear, and inner ear. The outer ear is the portion you can see and the middle ear is between the inner and outer ear. The auditory system helps us recognize dangers that we can't see and communicate with each other more easily. The outer ear includes all parts of the ear from the pinna to the eardrum. The most easily noticeable part of the outer ear is the pinna, also known as the auricle. The purpose of the outer ear is to collect sound and direct it into the rest of the ear. The pinna is the portion of the outer ear that is visible on the body. The seemingly strange and random shape of the ear was actually designed to efficiently collect sound waves and direct them to the ear drum through the ear canal. Some sound frequencies are amplified more than others by the pinna which can result in injury. The auditory canal, also referred to as the ear canal, is a tube connecting the outer ear to the middle ear. The ear canal is about one and one quarter inches long but this may vary from person to person. Within the ear canal are specialized glands that secrete cerumen, more commonly known as earwax. Earwax has many important functions within the ear canal: lubrication, cleaning, and defense against bacteria and other foreign particles. The middle ear is the part of the ear that lies between the outer ear and the inner ear. It is separated from the outer ear by the eardrum and separated from the inner ear by a wall with two small openings called the oval window and round window. The middle ear contains very important parts of the ear such as the eardrum and the ossicles. Also known as the tympanic membrane, the ear drum serves the purpose of vibrating when sound waves hit it, converting them into vibrations of the membrane as opposed to vibrations of the air. This membrane is very thin and almost transparent with a diameter of about 9 millimeters. It is held in place by the tympanic annulus which is a near complete ring of bone. Three layers of tissue form the membrane: the outer layer of skin is consistent with skin in the external cavity, the middle layer is made up of fibrous tissues that give the membrane its stiff properties, and the inner layer of the ear drum is consistent with the mucous membrane that lines the tympanum. Sensory nerves are in no short supply within the ear drum which is why one feels very sharp pains when the eardrum vibrates violently. The tympanum, also known as the tympanic cavity is a small space filled with air. It is divided into upper and lower spaces called the tympanum proper (lower) and the epitympanum (upper). The outer wall is formed by the ear drum, the ceiling and floor and are formed by two bones. There is a wall in the tympanum that separates the middle ear and the inner ear. This wall has two openings called the oval window and the round window. The tympanum houses the ossicles, essential components of the auditory system. There are three movable, minute bones (the smallest in the body) within the middle ear known as the ossicles. They are the Malleus, Incus, and Stapes but can be called by their more common names: Hammer, Anvil, and Stirrup. These bones are so tiny that all three are able to be fit on the face of a U.S. dime. The ossicles act as a compound lever and multiplying force allowing sounds to be amplified or even have their volume decreased through muscle movement and converting sound waves into mechanical vibrations. The malleus is attached to the ear drum. When the ear drum vibrates, so does the malleus. The Malleus is made up of two parts: the handle and the head. They were given this name because of their resemblance to the parts of a hammer of the same name. The handle is attached to the tympanic membrane which is how vibrations are transferred. The head of the malleus is attached to the incus and held in place by three ligaments to the epitympanum. 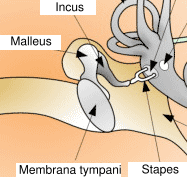 Attached to the malleus by a small synovial joint, the incus serves the purpose of connecting the malleus and the stapes so that they may properly perform their function. Attached to the incus via synovial joint, it is the smallest bone in the entire body at about 3 millimeters long. The base of the stapes lies inside the oval window. It is not rigidly attached to a fixed point to allow it to vibrate and transfer vibrations into the inner ear. The inner ear is a series of bony passages called labyrinths which contains the organ of hearing, the cochlea. This part of the air connects the ear to the brain and completes the process of interpreting sounds and sending it to the brain. The cochlea is known as the organ of hearing and it is a spiral-shaped tube that resembles a snail shell. The tube is coiled two and a half times around a hollow pillar in the center and is about 30mm long when stretch out straight. The shape of the coil forms a cone 9mm in diameter at the 5mm tall. The hollow pillar of the coil contains fibers of the cochlear nerve which is attached to the brain stem. The organ of Corti, or basilar papilla, is actually a collection of sensory hair cells arranged in rows. These hair cells create nerve impulses when sound vibrations pass them. The name organ of Corti comes from the man who described it first, an Italian anatomist named Alfonso Corti. The organ of Corti contains an arch or tunnel with hair cells within it. These hair cells respond to vibrations carried by fluid. The Human Body: Fearfully and Wonderfully Made! by Dr. Jay L. Wile, and Marilyn M. Shannon, M.A., Apologia Educational Ministries, Inc., 2001. The Ossicles R. Nave, HyperPhysics. The Ear: Auditory and Vestibular Systems Unknown author, PATTS, July 2001.
human ear Encyclopædia Britannica. 2009. Encyclopædia Britannica Online. This page was last modified on 13 August 2015, at 14:10.